The Linksys WUSB6400M AC1200 MU-MIMO USB Wi-Fi Adapter comes with a Wi-Fi Protected Setup ™ (WPS) feature for a quick and easy installation with a WPS-enabled router or access point. With WPS you can securely add devices to your wireless network without having to enter a network name and a password. This article will guide you on how to connect the wireless USB adapter to your router or access point using WPS. NOTE: The Linksys WUSB6400M driver must be installed first before using the WPS method. To install the driver, click here. 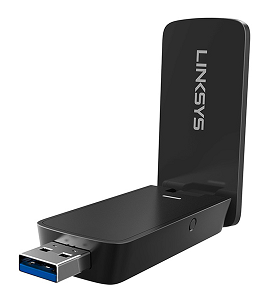 Plug the Linksys WUSB6400M into an available USB port on your computer. Press the WPS button on your wireless router or access point. Press the WPS button on the side panel of your wireless USB adapter for three (3) seconds to start the WPS pairing. NOTE: The LED of the wireless USB adapter will blink orange. To view the LED the flip antenna must be open. Wait for the LED to turn solid white indicating that the connection is successful. You should now have successfully connected your Linksys WUSB6400M to the router or access point. Plug your wireless USB adapter into an available USB port on your computer. On the menu bar, click the Wireless Utility icon. Scroll to the bottom of the list of available networks and choose the WPS… option. NOTE: The LED on the front of the wireless USB adapter will blink orange. 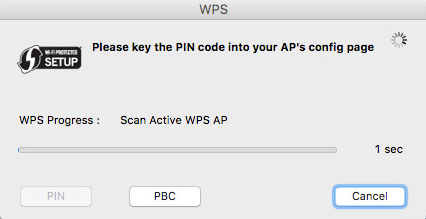 NOTE: The PIN method is not supported.